This time I flew an ILS, VOR and GPS approach – even without becoming airsick. My confidence is back and I am eager to finish this rating within the next two months. I scheduled about six flights now before Christmas and until then I also intend to get the written exam behind me. Cessna 43Lima, just another aeroplane in Denver’s class bravo airspace. Today’s flight brought me to the Rocky Mountain Metropolitan airport. The ILS approach went well, I was able to keep the needles more or less centered. The most difficult part of it is to find the wind correction angle and since the wind changes as you descend, the angle has to be adjusted. As a VFR pilot I never cared much if the heading was 5° degrees or so off. 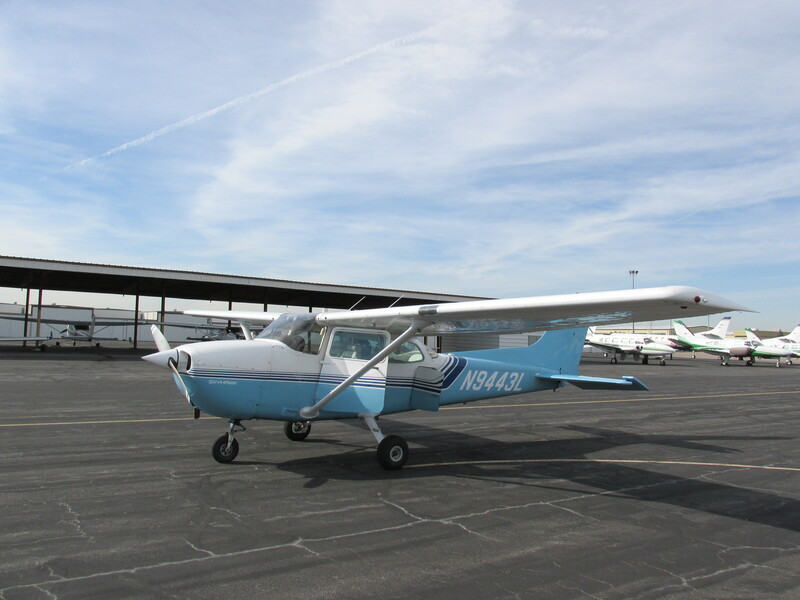 On a localizer approach the corrections should be limited to one or two degrees after passing the Final Approach Fix (FAF), which looks easy in the videos of the Cessna flight training online class when John or Martha are demonstrating but is difficult for me. At a distance of a few miles from the runway the course deviation indicator (CDI) and especially the glideslope (GS) become extremely sensitive. At least a real plane is much easier to control than a simulator. Again I have been amazed by the simplicity of the radio transmissions. I received a clearance into Denver International’s class bravo airspace without asking for it and the controllers handed me over to Tower and Approach frequencies where everybody was ready with an instruction for me when they heard my voice. But still, all that IFR radio work is new to me and I struggle when controllers talk plain english. Not because of the language but not knowing what to expect. A bit as if I was in the PPL class again, trying to get my first words right on the radio. 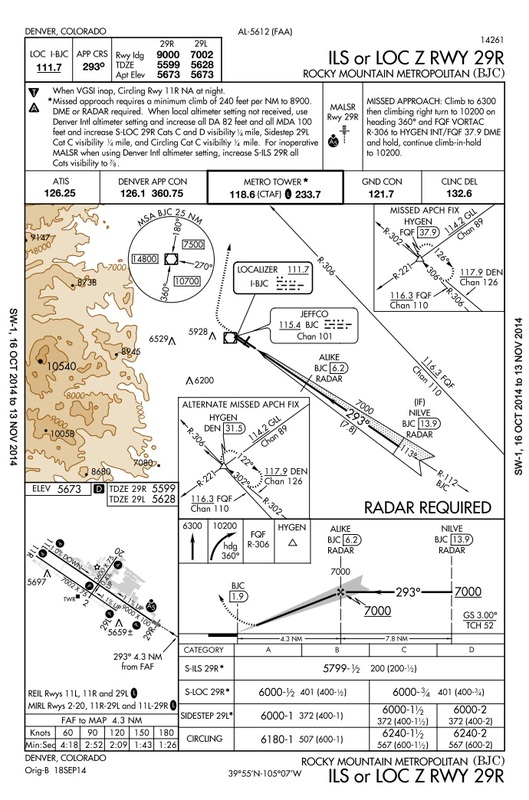 ILS or LOC Z RWY 29R into Rocky Mountain Metropolitan (no worries, I know these charts are out of date). During the missed approach I set everything up for the VOR approach. With Foreflight it isn’t hard to keep the cockpit organized. I am still using the kneeboard of the Cessna Flight Training class. After the last flight, on which I got airsick, I was thinking about buying a iPad arm that could be attached to the window. That way I wouldn’t have to move my head up and down and becoming sick would be less likely. After today’s flight I decided to stick with the kneeboard. At some point after completing the instrument rating I will know better what I need – and I still don’t like the idea of blocking the view out of the windows. It is good airmanship to keep the windshield clean – why should I put an iPad exactly where I would see the airport during a circling approach? VOR/DME RWY 29, non-precision approach. As you can see on the instrument approach plate (IAP), there are mountains West of the airport. This illustrates the importance of knowing where you are on an approach. Especially knowing the first instruction of the missed approach is vital. 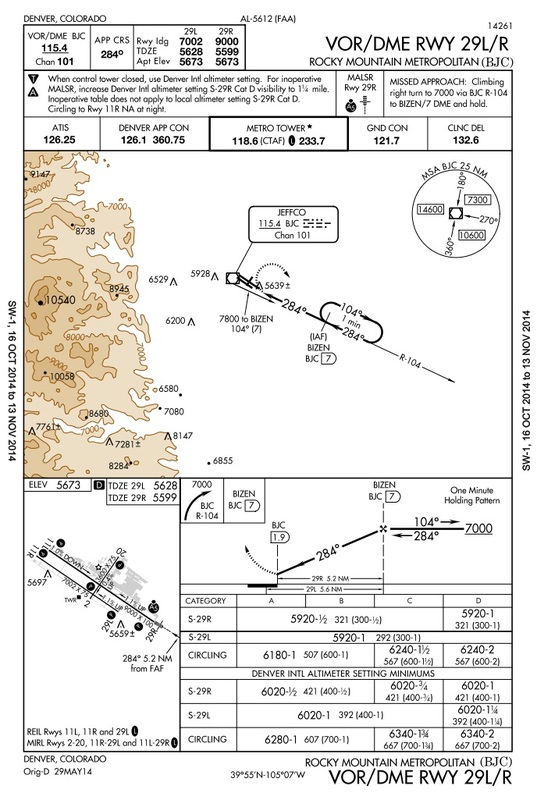 During non-precision approaches (no GS) like this one, it is necessary to calculate the required descent rates. It is a simple calculation to get from feet per nautical mile to feet per minute, but you want to get that done during the briefing on the ground. At least at this point in my training I have to be careful with my brain’s workload. 😉 I again ended up in front of the runway and flew the missed approach. On the flight back I prepared the RNAV (GPS) approach into Centennial. Working with the GPS requires a lot of button pushing and thus there are many gotcha’s. In my opinion ground based approaches are a lot more intuitive, even NDB approaches. One of my goals now is to become more familiar with the Garmin 650, it should become second nature to me. Looking back to what I have experienced so far, I can fully recommend to do the instrument rating in the USA. The people are friendly and always encourage you to go flying with them. The lessons are productive and at your paste. It seems I will make it within the minimum hours required and possibly below their advertised prices. Doesn’t matter if you want to do the rating within two weeks or like me over a few months, the instructors adapt to you. That is one of the main differences to the schools in Switzerland and I struggled with it. For the written exam back home for example, I had to wait three months until I had a spot. Here, I can call the test center and write the exam the following day. I like the training here and I am looking forward to the next flights.